What the Federal Reserve is actually whining about is not low inflation—it's that high inflation isn't pushing wages higher like it's supposed to. 1. Big-ticket expenses such as rent, healthcare and higher education—expenses that run into the thousands or tens of thousands of dollars annually—are severely underweighted or misreported. While rents are soared, the CPI uses an arcane (and misleading) measure of housing costs: owners equivalent rent. Why not just measure actual rents paid and actual mortgages/property taxes/home insurance premiums paid? 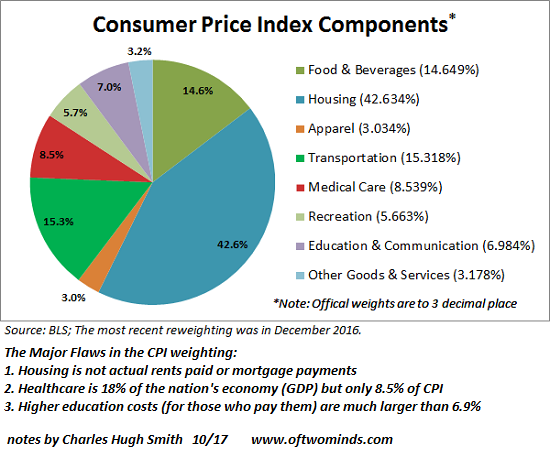 Healthcare is 18% of GDP but only 8.5% of CPI. To those exposed to actual costs of healthcare, 8.5% of the CPI is a joke. Then there are the hedonic adjustments that are made to reflect improvements in quality, features, safety, etc. So the price of computers is discounted to reflect the increase in memory, etc. compared to previous models. This is a can of worms, as anyone shopping for a new car or truck can attest: yes, the vehicles have more safety features, but the sticker price is much higher. Do we knock off $10,000 the "price" because of these additional features? Why should we, when consumers have to pony up $10,000 more than they did a decade ago? 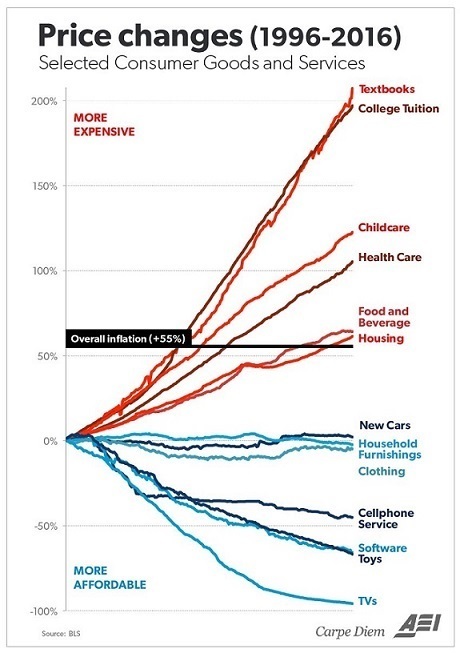 More honest and accurate estimates of real-world inflation that include the big-ticket categories of housing, healthcare, and higher education reckon annual inflation is around 7% or even as high as 10% in high-cost metro areas, not 2%. This sets up a very peculiar cognitive dissonance in the financial media. On the one hand, government agencies are bending over backward to under-report inflation. On the other, the Federal Reserve is whining that inflation is too low and their efforts to push it higher have failed. Heck, folks, the solution is obvious: just report real-world inflation without the hedonic adjustments and other shuck and jive, and when the rate of inflation comes in at a hot 7% instead of the official 2%, the Federal Reserve can declare victory. Why does the Fed want higher inflation? The general explanation is higher inflation benefits bankers, borrowers and the expansion of credit that underpins our consumerist economy. The idea is that as wages rise with inflation (assuming wages are rising, which they're not for the bottom 90%), households will have an easier time servicing existing debt and getting new loans. Banks benefit because they earn fees on originating new loans and rolling over existing debts into new loans. But the supposed benefits of high inflation are undercut if wages don't rise as fast as prices. As many observers have noted, wages for the bottom 90% have not kept pace with higher costs. 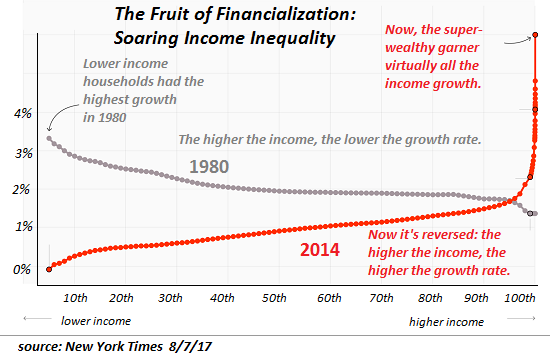 For the bottom 90%, rising rents, higher property taxes, higher health insurance premiums, higher healthcare co-pays and deductibles, soaring college tuition and so on, have squeezed household budgets while household income has stagnated. No wonder the government wants to mask the real rate of inflation. If it was widely understood that inflation is reducing our purchasing power at an annual rate of 7% while wages are rising at 1% or 2% if at all, people might realize the Fed and other authorities have strip-mined the many to enrich the few. So what the Federal Reserve is actually whining about is not low inflation—it's that high inflation isn't pushing wages higher like it's supposed to. In the simplistic models of conventional economics, inflation is supposed to be a monetary function, i.e. a generalized secular dynamic that pushes everything higher—not just prices, but wages, too. Alas, the world isn't as simple as the economists' models. 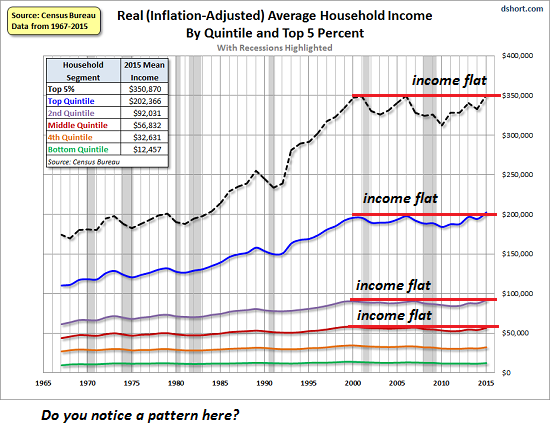 So what we have instead is stagnating wages and soaring wealth-income inequality. No wonder so many people reckon this was the real plan all along: it's worked brilliantly for the eight years of "recovery", greatly enriching the few at the expense of the many. Check out both of my new books, Inequality and the Collapse of Privilege ($3.95 Kindle, $8.95 print) and Why Our Status Quo Failed and Is Beyond Reform($3.95 Kindle, $8.95 print, $5.95 audiobook) For more, please visit the OTM essentials website.